Congenital heart lesions are very common and affect approximately 1 in every 100 babies born. The severity of these heart lesions ranges from very minor to more complex, serious problems. The ideal time to scan the fetal heart is after 23 weeks. However, routine scanning is usually done at the 18-20 week scan because some management options –like terminating a pregnancy — are more difficult after 20 weeks gestation. At 20 weeks, the heart is about the size of your thumbnail and has a lot of growing to do before birth. Therefore, it is not surprising that some fetal heart problems will not be evident at the 18-20 week routine scan. Under optimal imaging conditions, many of the major anomalies can be suspected. Who needs a fetal echocardiogram? Some pregnant women are at increased risk of giving birth to a baby with congenital heart disease (CHD). They should be considered for referral for a specialised fetal echocardiogram. There is a strong family history of congenital heart disease. Fetal heart ultrasound requires a great deal of expertise and experience. General heart screening is routinely performed at the 18-20 week scan. If there is any question of an anomaly of the fetal heart, prompt referral for a tertiary scan is warranted. At the tertiary scan, the fetal ultrasound specialist will not only re-evaluate the fetal heart but will also closely examine the rest of the fetus, looking for any other possible problems. In some circumstances, fetal karyotyping (testing the fetal chromosomes) will be indicated and the couple will be offered a CVS or amniocentesis. If a fetal heart abnormality is confirmed, arrangement for a scan with a paediatric cardiologist is usually made. This will provide very specific information about what the likely scenarios are for the baby after birth. Usually, together with the fetal ultrasound specialist, the paediatric cardiologist will perform an echocardiogram (ultrasound) of the baby’s heart. After the birth of your baby, the paediatric cardiologist will also perform an echocardiogram (ultrasound) to assess the state of the heart. The paediatric cardiologist will usually manage the baby’s care, together with the neonatologist (paediatrician) and cardiac surgeon, and decide the need for any treatment. Some of the most common congenital heart problems such as a small VSD ~ ventriculo-septal defect (hole in the heart) often do not require surgery, whereas more complex heart problems will require surgery. Some heart abnormalities are not detectable prenatally, even with a detailed expert examination. These tend to be minor defects, such as small holes in the heart, or mild valve abnormalities. In addition, some cardiac defects do not become evident until after birth. The results are very much dependent on how clearly the heart is seen and will depend on the position of the fetus and the image quality of the mother. After the scan is completed a full discussion of the findings and their implications will be explained to the couple/family members. Further fetal heart scanning is usually done at 32 and 36 weeks gestation. The frequency will depend on the fetal problem and the cardiologist involved in your case. Identifying a fetal heart problem will allow an in-depth discussion of what is likely to lie ahead for the baby and family after birth. Major heart lesions will require delivery in a major tertiary hospital in Brisbane that has adequate neonatal intensive care facilities. Your obstetrician will make these arrangements for you. Once your obstetrician has decided which hospital you are to deliver in, you may wish to arrange a tour of the intensive care nursery and cardiac intensive care unit in order to prepare yourself for where your baby will be. This is probably best done in the third trimester. The fetus has a different circulation in the womb than it does when it is born and the baby uses its lungs to breathe. This puts different flow pressures on different parts of the heart and the ultrasound appearances often change from what was seen in-utero compared what is seen post-natally in the baby. In a normal heart, there are two pumping chambers called ventricles and two chambers that receive blood called atria. 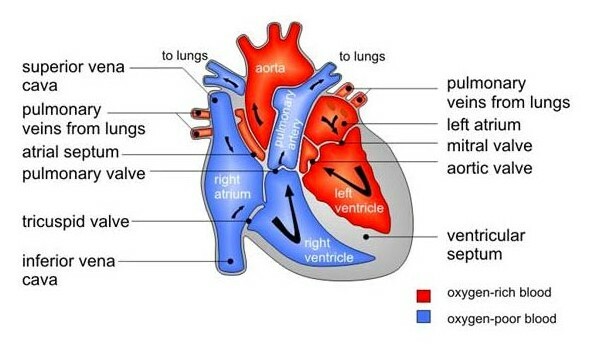 Blood enriched in oxygen (from the placenta) passes into the left atrium and then enters the left pumping chamber, the left ventricle. It is then pumped out through the aorta and around the body. The blood is then returned to the right atria via the vena cava (the main veins). The majority of this blood is passed into the left atrium via a normal hole in the heart, the foramen ovale. Here it mixes with the oxygenated blood that has arrived from the placenta. The remainder of the blood from the right atrium is then passed into the right ventricle. Since the fetus is not using its lungs, most of this blood is pumped along the ductus arteriosus into the descending aorta. The blood passes via the umbilical arteries through the placenta to receive oxygen enriched blood and back via the umbilical vein and back to the left atrium. Neonatal circulation. 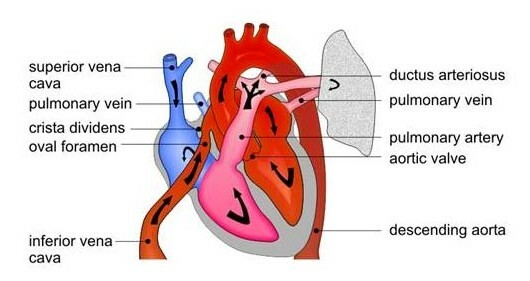 Note Ductus arteriosus is closed. After birth, the ductus arteriosus closes and the blood from the right ventricle is pumped through the lungs to receive oxygen. From the lungs it passes to the left atrium and then into the left pumping chamber and through the aorta to the body. Visit the RCH cardiology website for a basic overview of the different congenital heart lesions.